It all started when last week Elon Musk shared a picture of the Tesla Semi Truck prototype carrying Tesla cars on its car carrier trailer — now Tesla releases two short clips of their electric semi effortlessly moving the cars on its back. 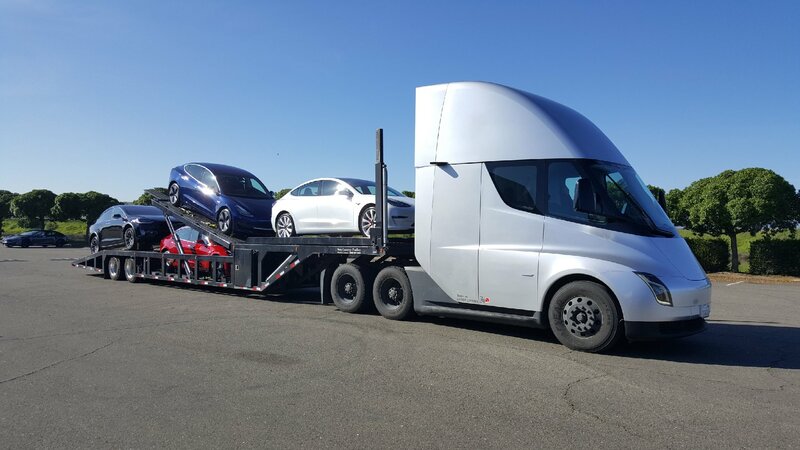 Tesla Semi Truck carrying Tesla cars on its carrier trailer. Tesla again faced a delivery hell at the end of Q1, 2019 — this time not just in the United States but in China and Europe too, the Silicon Valley-based automaker desperately needs more efficient and cost-effective car transport carriers, Tesla Semi is the ultimate answer. While this is currently experimental but it is a glimpse into the future of zero-emissions transportation ecosystem, electric vehicles delivering electric vehicles, just fantastic. Tesla Semi Truck is aimed to go into production by the end of next year, with around 640 trucks already pre-ordered the company should be able to achieve the goals on time as they have done in 2019 with Model 3 deliveries to China and Europe. Let’s watch how smoothly and silently the Tesla Semi Truck car carrier moves the company’s vehicles on highways, aerial shots are amazing to look at, especially the aerial shots in the second video. The orange lights above the Tesla Semi windshield are ‘Front Clearance Lamps’, required for vehicles 2032 mm (80 in.) wide or wider, Tesla clarified in an answer to a follower on Twitter. The same silver prototype Tesla Semi visited Sacramento, CA last week and some rare interior pictures of the electric hauler emerged from the event and we reported that it was going back to the Bay Area afterward, the purpose of it coming back was this beautiful video shoot. Tesla tweeted the following video of the Tesla Semi with a front angle going towards the right side to showcase the symmetrical design of the electric truck.